Kohl’s Corp said it continued to see strong momentum across its Active categories in the fourth quarter. The retailer also said that its test of expanded Active areas will be extended to 160 stores and Nike plus-size offerings will arrive this spring. 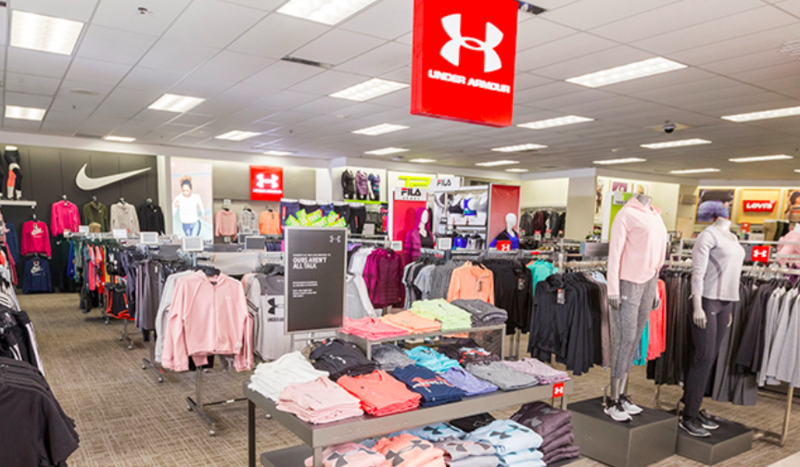 She added that with the continued success Active, Kohl’s will be extending its in-store Active expansion strategy to approximately 160 of its highest-performing Active stores in 2019. Kohl’s launched its “active expansion test” in 30 stores last August. In the sections, square footage dedicated to Active expanded by 40 percent. Beyond national brands such as Nike, Under Armour and Adidas, the Active push is being supported by the chain’s private label brands, like Tek Gear. The company’s active assortment has also expanded with category additions and relevant product offerings, including men’s golf and big & tall apparel, in 2018. Further linking the chain to fitness, Kohl’s on Tuesday announced a development partnership with Planet Fitness, the franchisor and operator of fitness centers. Initially, the plan calls for up to 10 Planet Fitness stores to open adjacent to select Kohl’s stores across the country in 2019 with the opportunity for additional locations in the future. Companywide, Kohl’s Inc. reported earnings and revenue in the fourth quarter that topped analyst’s targets and gave an upbeat outlook for 2019. Earnings on an adjusted basis rose 17.3 percent to $366 million, or $2.24 a share, from $312.0, or $1.87. Results beat Wall Street’s consensus estimate of $2.18. Net sales were down 3.3 percent to $6.82 billion but topped the consensus target of $6.58 billion. Comps were ahead 1.0 percent against a 6.3 percent gain last year and topped the consensus expectation of 0.3 percent growth. Net income fell to $272 million, or $1.67, from $468 million, or $2.81, a year ago. Both periods included non-recurring items related to impairments, store closures, a loss on the extinguishment of debt and the impact of tax reform. The comp gains were driven by the 1.2 percent increase for the combined November-December holiday period announced in January. The sales performance was driven by positive transactions and a double-digit increase in digital sales, which was on top of the 26 percent increase in the fourth quarter of last year. Geographically, strength across the country, except for slight softness in the Northeast. The Midwest region was the strongest. From a line of business perspective, children’s and men’s outperformed the company’s comp average. The core women’s business, which excludes juniors, was flat, driven by strength in modern, casual and Active categories. Gass said children’s saw strength across all categories. The introduction of LEGO and FAO Schwarz, along with enhanced in-store and digital toy experiences, drove a “significant increase” in toys in the quarter. In apparel, strength was seen in Active categories, national brands such as Carter’s, and its proprietary Jumping Beans brand. Footwear ran in line with the company average with another quarter of positive comps, driven by strength in Active brands, fashion boots and casual national brands such as Vans, Koolaburra by Ugg and Clarks. Home also ran positive, coming off of an “exceptionally strong” Q417. Drivers included key holiday items in electronics, in kitchen electric, such as the instant pot, and in core categories including bedding and luggage. Accessories was essentially flat as strength in beauty and fashion accessories were matched by underperformance in handbags and jewelry. The core women’s business “continues to be a key priority” for Kohl’s and strength was seen in modern apparel, Active, intimates and sleepwear. Juniors and women’s classics underperformed. Gross margin increased 1 basis point to 33.5 percent and was in line with internal expectations. Fourth quarter margin reflects increased mix headwinds from strengths in categories such as electronics and toys, a higher penetration of digital sales during the holiday period, and a continued shift to national brands. SG&A decreased 1.9 percent to $1.7 billion for the quarter although still increasing as a percent of sales to 24.8 percent from 24.4 percent. Expense savings from its Operational Excellence program was able to offset wage pressures. IT expenses increased due to continued investments in the cloud and other technology initiatives and marketing expenses were also slightly higher as its spend shifted from earlier to later in the year to capitalize on competitor store closures. Inventory per store decreased 2 percent, slightly less than expected due in large part to West Coast port delays, which impacted the timeliness of seasonal receipts. Kohl’s achieved its 12th consecutive quarter of lower inventory levels and a 15 basis point increase in fourth quarter inventory turn. Gass said driving traffic continues to be Kohl’s number one priority with one focus being a shift to digital marketing. About half of its marketing spend was digital in the fourth quarter, “allowing us to be more agile throughout the season and to deliver more personalized marketing messages direct to our customers,” said Gass. Kohl’s is also placing a greater focus on key events in the holiday season, expanding its next generation loyalty program, Kohl’s Rewards, and further investing in personalization efforts. In omnichannel, the online growth reflected investments in the mobile app, Your Price, Personalized Search, Smart Cart and fulfillment options such as BOPIS. Mobile again represented the majority of traffic growth in the fourth quarter, at over 70 percent of digital traffic and more than half of digital sales. Stores are now able to fulfill as much as 40 percent of digital orders with in-store pickup. Mobile checkout functionality was introduced to 150 stores. Ship-from-store capabilities will expand to 135 stores this year. Other merchandising plans in 2019 include the launch of Nine West in shoes, handbags and apparel, as well as Scott Living in home. PreviousBlack Diamond’s Product Innovation Fueling Clarus Corp.